When I was in Cambridge earlier this month, I thought I had seen the last of the wisteria this summer in Chapel Court when I visited Sidney Sussex College. There were just some shots of blue and light purple in the flowers and bright foliage dripping from the vines along the wall throughout Chapel Court, Hall Court and Cloister Court, and dangling over into Sidney Street. I have a particular fondness for the wisteria in Sidney Sussex. 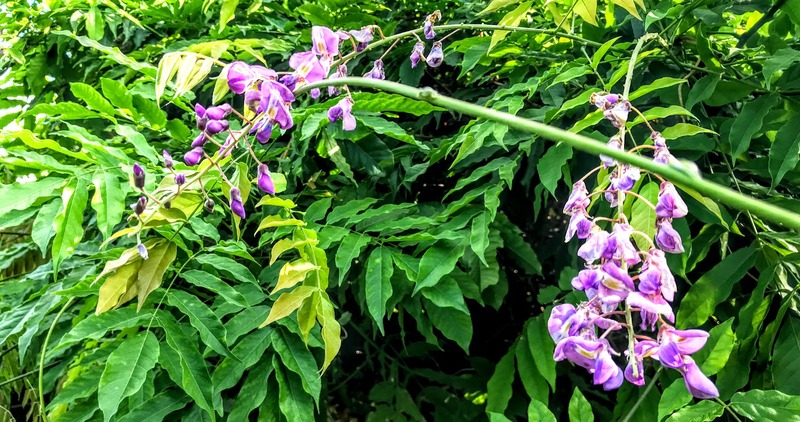 In May and June, wisteria covers college walls, pretty cottages, terraced houses, and even appears on student accommodation throughout Cambridge. But I thought I had seen the last of wisteria this summer in Cambridge earlier this month on my way to and from the USPG conference in High Leigh in Hoddesdon, Hertfordshire. Then, during the weekend, as I strolled through the Town Park in Adare, Co Limerick, opposite the Heritage Centre on the Main Street, my eyes were drawn to some flowering wisteria that has survived into these final days of wisteria, I reminder of the promises of summer from six or seven weeks ago – and what a summer it has been. The park has a number of beautiful walks and pathways, and a thatched gazebo that is attractive for families on summer weekends and that is probably a popular location too for pretty wedding photographs. 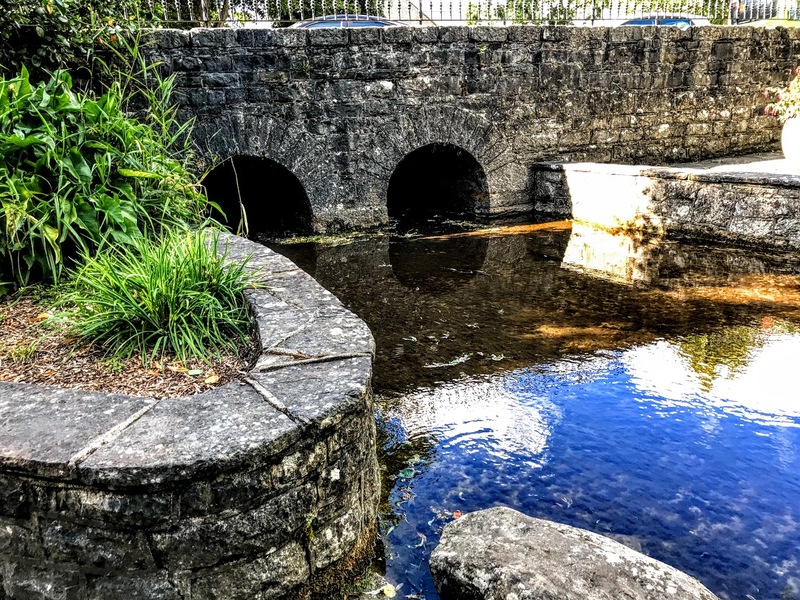 At one of the entrances to the park, the ‘Washing Pool’ or Linn Níocháin is formed by a tributary stream of the River Maigue, the Droichidin, as it flows under a two-arched bridge. In the past, groups of women gathered here regularly to wash their clothes and talk about village life. Before the days of washing machines, washing powder and detergents, these women did their washing on spittle stones in the stream bed or by pounding the clothes with wooden washing bats or beetles. The Washing Pool was also a watering place for horses. 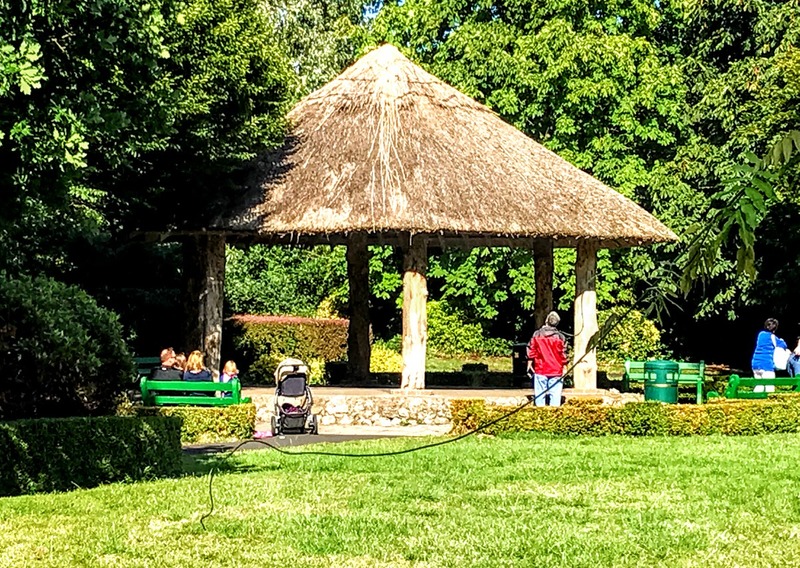 The land for the town park and the thatched wooden gazebo were presented to the town of Adare by the Dunraven family of Adare Manor in 1975, and an avenue of chestnut trees that once led up to Adare Manor is now part of the park. The pool, dating back over 200 years, was restored and the banks paved by Limerick County Council and the Adare Tidy Towns Association during European Architectural Year in 1975. But it seems the tourists come to Adare mainly to see the thatched houses that line the south side of the Main Street. 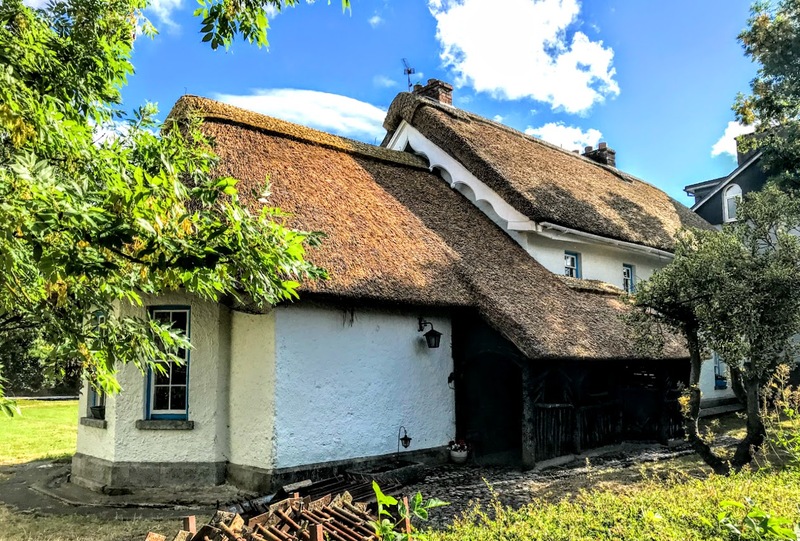 They are picturesque in a picture-postcard or chocolate-box type of way, and many of those tourists must think these are stereotypical Irish thatched cottages. But, of course, few of these are cottages. Today, many of them are boutique shops and highly-recommended restaurants. But they were built as family homes, they are often two-storeyed, and as I walked along the Main Street at the weekend I imagined that most of these thatched houses would fit more perfectly in Grantchester or Trumpington than on a small-holding with subsistence farming in 19tth century remote, rural and poverty-stricken Ireland. The original thatched houses in Adare were built in the 1820s as homes for people employed on the Earl of Dunraven’s estate, on the farm, in the Manor House or in the cigarette factory. For a short time, tobacco was cultivated as a crop on the Adare estate as part of the economic plans of the 4th earl of Dunraven, who also built a factory, the Adare Cigarette Company, on his estate. The firm once employed about 70 people in grading the tobacco leaves in the factory in Adare. So these thatched houses have an urban rather than a rural context for their story over the generations. 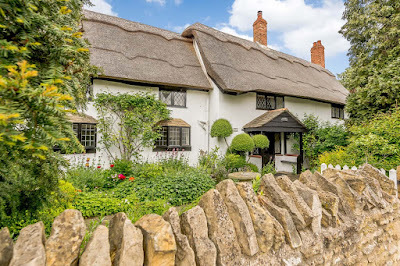 On Saturday [28 July 2018], the Guardian ran a feature on thatched houses in England. Readers were tantalised by the opportunity to get the ‘chocolate box’ look with traditional properties from Devon to Suffolk. 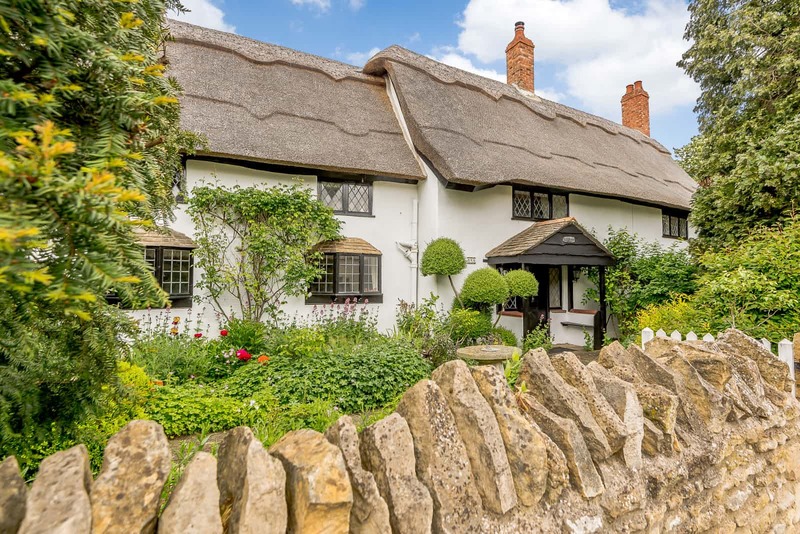 They ranged in price from £265,000 for a one-bedroom semi-detached cottage with an unusual thatched catslide roof is on the edge of a village three miles south-west of Andover, in Hampshire, or £295,000 Fleur De Ley, a former public house dating back to the 1700s and now a four-bedroom cottage in Clifton Hampden, a village near the market town of Abingdon, eight miles from Oxford. £850,000 could buy Foxgloves in Longthorpe in Cambridgeshire, a village two miles from Peterborough. Foxgloves can genuinely claim to be a ‘chocolate box’ property – a photograph of the four-bedroom Grade II listed house actually graced some Cadbury’s chocolate boxes 40 years ago. All of these houses could sit easily into Grantchester or Trumpington, as could any of the thatched houses in Adare. There is a deeper, shared culture that brings these two islands together than is expressed in the narrow nationalism of Brexiteers or those who wrap the green flag around themselves far too loudly.